On a special Labour Day weekend in the United States' 21st most populated city area, Baltimore is currently abuzz with the aria of high performance race engines. Announced last July, the state of Maryland's largest city of Baltimore prepared to host a first-ever street race with the headline attraction being the IZOD INDYCAR Series. 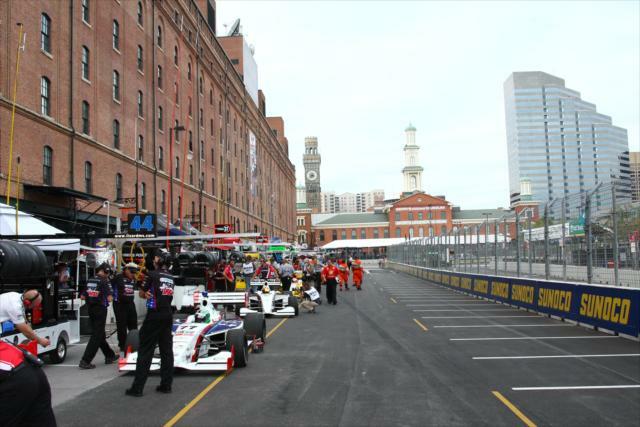 Assembled for an inaugural running, the 2011 Baltimore Grand Prix welcomes North America's top open wheel racing talent of IZOD INDYCAR and the Firestone Indy Lights Series is joined by the American Le Mans Series sports cars. Presenting a 12-turn, 2.04-mile street course, the Baltimore Grand Prix track scenery delivers much of the urban beauty of the historic United States city including Camden Yards and the Inner Harbor. The vast unknowns of a brand new race track greeted every driver and team member enter the Baltimore Grand Prix race weekend expecting the unexpected. The first temporary grand prix street race for the city of Baltimore, the event has not been without some customary missteps. Complications resulting to Hurricane Irene just a week prior to the Baltimore Grand Prix required the track crews to reassemble the track's retaining fences. This procedure would run into the Friday morning of the first day of race track activities causing a delay for on-track action. There have also been the regular chorus of unhappy residents and businesses as they get used to city streets being isolated from public traffic. Drivers and teams competing for this inaugural Baltimore race weekend are understanding for the minor event hiccups. Australian driver Will Power for Penske Racing commented the street circuit saying, "They did a really good job creating the circuit. It takes a lot of commitment and there are several technical bits, it's bumpy and I think it will be a great race! It is very tricky in certain places, but that is typical of a street course." The overall opinion of the 2.04-mile temporary road course within the commercial center of Baltimore describes the track as a technical environment. A combination of bump and smooth surfaces is mentioned to provide a major challenge for race engineers to properly dial in a racing machine. Newman/Haas Racing rookie driver James Hinchcliffe commented on after Friday IZOD INDYCAR Series practice, "At the end of the day, they have done a good job with the track. The front is really bumpy but the rest of the track is quote smooth and pretty nice. It's a good layout with some technical parts. It's really tricky and difficult to get one full lap together will all your best sectors so qualifying is going to be a serious test." While the IZOD INDYCAR Series prepares for the weekend's 75-lap main event on the streets of Baltimore Sunday, Saturday's top race will be a two-hour competition between prototype and GT category sports cars of the American Le Mans Series. Corvette Racing driver Tommy Milner's impression of the track leads sports car fans to expect the street course has the ingredients for a superb event. "There are two good passing spots. It's going to be tough to pass in GT because everyone is so close, but everything is slow enough that you can rub some fenders and make things happen. I'm looking forward to the race tomorrow." After more than a year of planning, the 2011 Baltimore Grand Prix opened awaiting a Friday crowd which could be a 'make it or break it' the early success of the auto racing event. Judging by early speculation on the spectator count, the Baltimore Grand Prix is shaping up with the makings of an enduring event for the Maryland city.